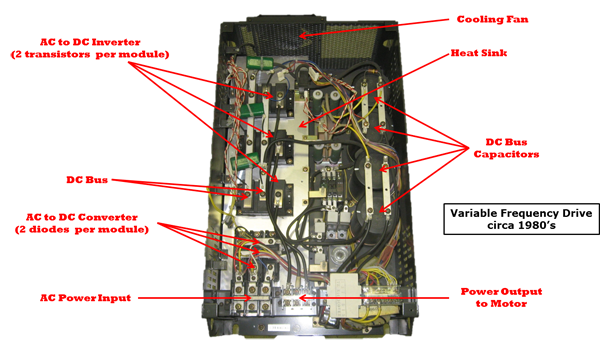 The first stage of a Variable Frequency AC Drive, or VFD, is the Converter. The converter is comprised of six diodes, which are similar to check valves used in plumbing systems. They allow current to flow in only one direction; the direction shown by the arrow in the diode symbol. For example, whenever A-phase voltage (voltage is similar to pressure in plumbing systems) is more positive than B or C phase voltages, then that diode will open and allow current to flow. When B-phase becomes more positive than A-phase, then the B-phase diode will open and the A-phase diode will close. The same is true for the 3 diodes on the negative side of the bus. Thus, we get six current “pulses” as each diode opens and closes. This is called a “six-pulse VFD”, which is the standard configuration for current Variable Frequency Drives. Note that in a real VFD, the switches shown would actually be transistors. 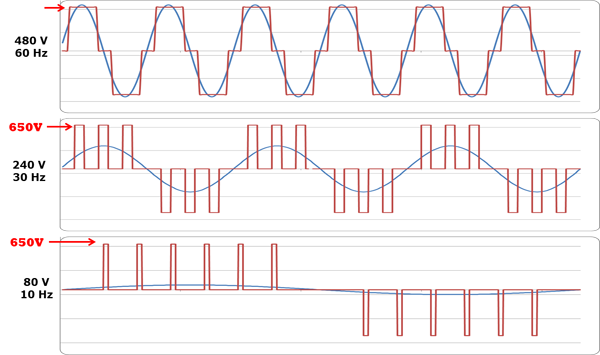 When we close one of the top switches in the inverter, that phase of the motor is connected to the positive dc bus and the voltage on that phase becomes positive. When we close one of the bottom switches in the converter, that phase is connected to the negative dc bus and becomes negative. Thus, we can make any phase on the motor become positive or negative at will and can thus generate any frequency that we want. So, we can make any phase be positive, negative, or zero. 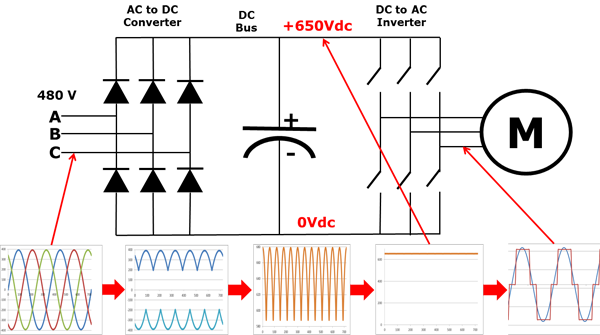 Notice that the output from the VFD is a “rectangular” wave form. 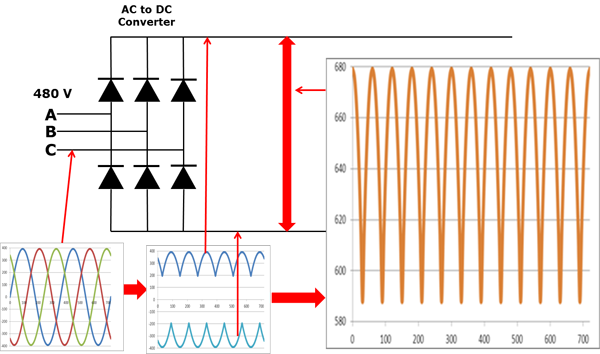 VFD’s do not produce a sinusoidal output. This rectangular waveform would not be a good choice for a general purpose distribution system, but is perfectly adequate for a motor. If we want to reduce the motor frequency to 30 Hz, then we simply switch the inverter output transistors more slowly. 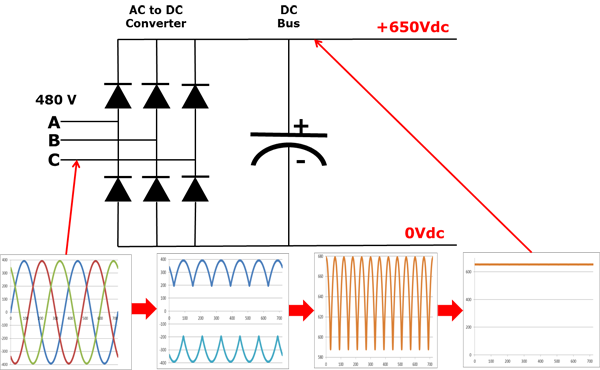 But, if we reduce the frequency to 30Hz, then we must also reduce the voltage to 240V in order to maintain the V/Hz ratio (see the VFD Motor Theory presentation for more on this). How are we going to reduce the voltage if the only voltage we have is 650VDC? This is called Pulse Width Modulation or PWM. Imagine that we could control the pressure in a water line by turning the valve on and off at a high rate of speed. While this would not be practical for plumbing systems, it works very well for VFD’s. Notice that during the first half cycle, the voltage is ON half the time and OFF half the time. Thus, the average voltage is half of 480V or 240V. 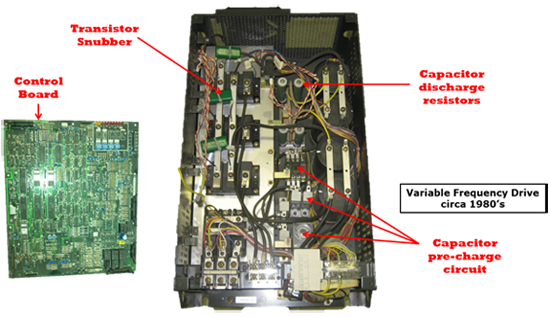 By pulsing the output, we can achieve any average voltage on the output of the VFD. See the Pictures below to understand what the different parts of a drive look like.